Spokane is a city of over 200,000 located along the Spokane River in eastern Washington. The regional service center was founded in 1871 and incorporated on November 29, 1881. This guide looks at some of the roads serving Washington’s second largest city. Widening of Interstate 90 between Argonne Road (Exit 287) and Sullivan Road (Exit 291B) through Spokane Valley added a lane in each direction from August 2003 to November 15, 2005. The project cost $37-million.8,15 A $4.5-million project between 2007 and 2009 reconfigured the westbound ramps at Pines Road (Washington 27) to tie into parallel Indiana Avenue rather than Washington 27, 150 feet south of its intersection with Indiana Avenue. This followed work on the south side of the interchange in 1997.16. Two Business Loops of Interstate 90 serve the Spokane metropolitan area. The first is a sparsely signed route encompassing much of old U.S. 10. Beginning at Exit 276 of I-90, the route follows Grove Road north to Geiger Boulevard, where the route overtakes the former U.S. 10 eastward into Spokane along a combination of Geiger, Sunset Boulevard and 2nd/3rd Avenues. Sprague Way carries the unsigned route from the couplet of 2nd and 3rd onto Sprague Avenue below SR 290. Sprague Avenue then continues Business Loop I-90 east into Spokane Valley and Exit 285, where the designation concluded. As approved by AASHTO (American Association of State Highway and Transportation Officials) on May 5, 2013, an extension of the Business Loop for Interstate 90 takes the route through Spokane Valley, following the Valley Couplet of Appleway Boulevard (east) and Sprague Avenue (west) to University Road at Dishman. Sprague Avenue continues east from there as a two-way arterial, doubling as Business Loop I-90 through to Appleway Avenue, which returns the business route northeast to Interstate 90 at Exit 294. U.S. 2 follows Sunset Highway east from Airway Heights to Spokane International Airport (GEG), where the route turns southeast onto a freeway connecting with Interstate 90. I-90 doubles as both U.S. 2 and U.S. 395 from Exits 277 to 281, where U.S. 2 & 395 depart for the couplet of Browne and Division Streets east of downtown. U.S. 2 & 395 remain together along Division Street or its couplet with Browne and Ruby Streets, through to a split near Country Homes in north Spokane. There U.S. 2 turns easterly to meet the North Spokane Corridor by Mead before resuming a northward heading to Chattaroy and Newport. Sunset Boulevard (and Sunset Highway west of Geiger Boulevard) represents the former surface alignment of U.S. 2 leading into Spokane from the west. The route doubles as former U.S. 10 and 395 eastward onto 3rd Avenue through downtown. Prior to the Interstate system, U.S. 10 was the main east-west route through eastern Washington, joining Spokane with Seattle to the west and Coeur d’Alene, Idaho to the east as part of a 2,246-mile course between the Emerald City and Manitowoc, Wisconsin. Completion of Interstate 90 replaced the route, leading to truncations eastward starting in 1969 with the portion from Spokane to Seattle and in 1971 from Coeur d’Alene, Idaho to Spokane. Within the Spokane area, U.S. 10 traveled Geiger Boulevard northeast with U.S. 395, a roadway that remains partially a service road to Interstate 90 and independent of the freeway as a Business Loop for I-90 through to Sunset Boulevard. Sunset Boulevard was old U.S. 2, and together U.S. 2-10-395 combined into western reaches of Spokane to 3rd Avenue. U.S. 195 also joined the fray from Inland Empire Way. East into downtown Spokane, U.S. 2-10-195-395 followed 3rd Street to Division Street, where the trio broke off to the north while U.S. 10 remained along 3rd Avenue to Sherman Street. Sherman Street took the route four blocks north to Sprague Avenue, its alignment eastward to East Spokane, Dishman, Opportunity through what is otherwise known as Spokane Valley. U.S. 10 branched northward from Sprague Avenue at Greenacres for Appleway Avenue east into Liberty Lake, follow that roadway northeast to Seltice Way in Idaho. A portion of that route was severed by construction of Interstate 90 between Exits 294 and 296 and again at Exit 299. U.S. 195 joins Spokane with Spangle, Rosalia, Colfax and Pullman to the south. The route follows a four-lane divided expressway southward from its beginning at Interstate 90 (Exit 279) to a point just north of Spangle. The route travels just 95 miles overall to an end at U.S. 95 just northwest of Lewiston, Idaho. Historically U.S. 195 was the sole route from north Spokane to Sandpoint, Idaho. An extension of U.S. 2 west from Bonners Ferry, Idaho to Everett was made in 1948, leading to a 20 plus year time period of shared alignments with U.S. 195 southwest from Sandpoint to Spokane. U.S. 195 was signed along side U.S. 2 & 395 along Division Street and U.S. 2-10-395 west from Division Street until 1969, when it was truncated to Inland Empire Way and Sunset Boulevard. The highway enters Spokane coupled with Interstate 90, from Ritzville to the southwest, to the couplet of Browne and Division Streets with U.S. 2, east of downtown Spokane. U.S. 2 & 395 share pavement along Division Street or Division Street with Browne and Ruby Streets northward through the Spokane street grid to the Country Homes community. There U.S. 2 veers eastward toward Mead while U.S. 395 remains on a northward course to Wandermere. Widening of U.S. 395 from just north of the Little Spokane River occurred on a four-mile stretch as part of a $7.4-million project in 1999.9 Eventually U.S. 395 will leave this overlap for the North Spokane Corridor, a 10-mile freeway planned to link Wandermere with Interstate 90 at East Central Spokane. The 1956 concept focused on the Hamilton-Nevada corridor, but was halted due to community opposition from East Central residents citing a division of their neighborhood. In 1967, the Hamilton-Nevada corridor was again the focus of a freeway proposal per a $400,000 study and an increase in the state gas tax. A public meeting held at the Spokane Coliseum in 1970 on the corridor mostly met with negative public feedback, but an advisory vote undertaken in 1973 resulted in a 58% approval by Spokane voters. The next year the North Spokane Freeway was shelved due to both a lack of construction money and continued strong opposition. A 1997 environmental impact statement revised the project as the North Spokane Corridor, citing an estimating $857-million price tag. $122 million in funding over a six year period was approved by Referendum 49 in 1998, which set aside $2.4-billion funding for transportation projects statewide. However Initiative 695 approved by voters in November 1999 cut the transportation budget by a third, eliminating the revenue stream needed to pay for Referendum 49 projects. This cut off the majority of funding for the North Spokane freeway, estimated to cost $892-million and take 20 years to build in 1999.13. The northbound beginning of the North Spokane Corridor beyond Freya Street. Signs along the route refer to the freeway as Future U.S. 395. Photo taken by Jeff Royston (July 11, 2013). Washington 27 originates at the intersection of Trent Avenue (Washington 290) and Pines Road in Spokane Valley. The state route leads south to an interchange with Interstate 90 (Exit 289) and as a busy arterial route from there through Opportunity and central Spokane Valley. The 90-mile route meanders south from the Spokane area to Oakesdale, Garfield, Palouse and Pullman. SR 27 ended at Interstate 90 until 1991, when the extension to SR 290 was made. Traveling 15.3 miles, Washington 206 follows Mount Spokane Park Drive northeast from U.S. 2 near Mead, to Mount Spokane State Park. Washington 290 follows a surface alignment along Trent Avenue west from Idaho 53 by Otis Orchards through northern reaches of Spokane Valley to Millwood and Orchard Park in Spokane. The state route turns south at Hamilton Street for a short freeway connector leading to Interstate 90. Washington 291 travels 33.1 miles from the intersection of Division Street and Francis Avenue in Spokane to Washington 291, mostly along the course of the Spokane River and Long Lake. Ash Street southbound at Maxwell Avenue. Ash Street south along with Maple Street north constitutes a through route couplet from West Central Spokane northward to Country Homes Boulevard near Town And Country. Maxwell Avenue leads west to becomes Pettet Drive along the Spokane River. Photo taken 09/01/06. Ash Street prepares to split with the Maple Street connector south of Boone Avenue. The Maple Street Bridge spans the Spokane River, linking West Central Spokane with Interstate 90. Photo taken 09/01/06. Traffic splits with the final two blocks Ash Street for the Maple Street connector. Photo taken 09/01/06. Following the connector from Ash Street south onto Maple Street, which switches from one-way north into a four-lane arterial. Photo taken 09/01/06. Maple Street drops below grade and passes under Broadway Avenue along a short expressway segment leading south across the Spokane River into Peaceful Valley. Photo taken 09/01/06. Just beyond the Broadway Avenue overpass is the site of the former toll plaza for the Maple Street Bridge. The Spokane River crossing was tolled until July 13, 1990.26 Photos taken 09/01/06. A short tunnel carries Summit Parkway and a wide right of way over the Maple Street Bridge just north of the Spokane River. Photo taken 09/01/06. The Maple Street Bridge opened to traffic on July 1, 1958 after over two years of construction. The 1708 foot bridge cost $6 million to build.26 Photo taken 09/01/06. A viaduct extends southward from the Maple Street Bridge through Peaceful Valley to ramps with 1st Avenue at Sprague Avenue. Photo taken 09/01/06. A loop ramp carries drivers from Maple Street south onto 1st Avenue east for the city center while the street splits with Walnut Street as a southbound only roadway to 2nd Avenue. 2nd Avenue, along with 3rd Avenue, represents a couplet eastward parallel to Interstate 90. Westward, the two avenues combine as Sunset Boulevard ahead of Hangman Creek. Photo taken 09/01/06. Maple Street south at 3rd Avenue east. 2nd and 3rd Avenues represent an unsigned business loop for Interstate 90 east from Sunset Boulevard. Photo taken 09/01/06. South from 3rd Avenue, one block remains before the departure of the westbound on-ramp to Interstate 90. Signs for the connection reference U.S. 2 west, U.S. 195 south and U.S. 395 south. 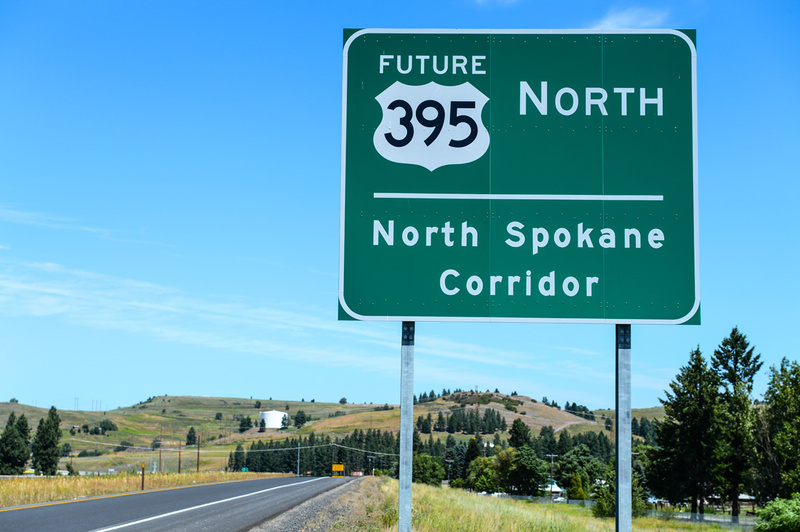 U.S. 2 & 395 share pavement with I-90 through Spokane to Division Street. U.S. 195 begins at the next westbound off-ramp (Exit 279). Photo taken 09/01/06. Traveling through the signalized intersection with 4th Avenue, Maple Street nears the westbound ramp for Interstate 90 & U.S. 2-395. U.S. 195 begins a 95-mile trek to Lewiston, Idaho from I-90 southeast through Hangman Valley along an expressway leading south to Spangle. Photo taken 09/01/06. Interstate 90 and U.S. 2 split ahead of Spokane International Airport, while U.S. 395 remains with the freeway southwest to Ritzville. Seattle and the west end of Interstate 90 lie 280 miles to the west. This guide sign was replaced by 2011. Photo taken 09/01/06. A split-diamond interchange joins Interstate 90 & U.S. 2-395 with Maple Avenue via connections with 4th Avenue west and 5th Avenue east. The eastbound on-ramp to Idaho depart from 5th Avenue at Walnut Street, one block east of Maple Street. A rare state-named shield for I-90 was posted at the turn onto 5th Avenue. This was replaced with a new guide sign including the control city of Coeur d'Alene by 2011. Photo taken 09/01/06. A westbound off-ramp connects Interstate 90 with Lincoln Street, just south of its intersection with 3rd Avenue. Photo taken 09/01/06. Three tracks of the BNSF Railroad pass over Lincoln Street on the south side of downtown Spokane. Photo taken 09/01/06. Entering the Spokane city center along Lincoln Street ahead of 1st Avenue. Photo taken 09/01/06. 1st Avenue travels east, complimenting Sprague Avenue west, as the main routes to and from Peaceful Valley and the Maple Street Bridge to the west. Photo taken 09/01/06. Sprague Avenue leads west from Lincoln Street to Riverside Avenue and the Maple Street Bridge. Eastward, the avenue connects downtown with East Central as unsigned Business Loop I-90 to East Spokane. Photo taken 09/01/06. Riverside Avenue crosses Lincoln Street at the next intersection as a four-lane boulevard east to U.S. 2 & 395 (Division Street north) and west to High Bridge Park and Government Way. Photo taken 09/01/06. Eastbound along Riverside Avenue at Post Street in downtown Spokane. Photo taken 09/01/06. A series of sky bridges link buildings above Riverside Avenue between post and Washington Streets. This view looks eastbound at Wall Street. Photo taken 09/01/06. Howard Street crosses Riverside Avenue at the next traffic light, leading north to Rotary Fountain at Riverfront Park. Photo taken 09/01/06. Stevens Street forks south from Washington Street at Riverfront Park as a four-lane southbound street to the Cliff Cannon neighborhood south of Interstate 90. Photo taken 09/01/06. Washington Street compliments Stevens Street with four lanes northbound through the Spokane city center. Photo taken 09/01/06. Bernard Street stems north from 1st Avenue and the Spokane Amtrak and Greyhound Station across Riverside Avenue to the Spokane Convention Center. Photo taken 09/01/06. Next in line for Riverside Street east is Browne Street south. Browne Street doubles as U.S. 2 west & 395 south from the Division Street over the Spokane River to Interstate 90. One block further east on Riverside Drive was the end of the street at Division Street (U.S. 2 west & 395 north). A $3.8-million project extended the roadway east from there as the new Martin Luther King, Jr. Way. The new four-lane roadway serves the University District with connections to Sherman Street at a realigned Spokane Falls Boulevard. It opened initially on May 29, 2012, with a future extension to Trent Avenue at Erie Street planned.23 Photo taken 09/01/06. Sprague Avenue carries three westbound lanes from St. Bernard Street to Riverside Avenue through the Spokane city center. This view looks at Howard Street. Photo taken 09/01/06. Sprague Avenue merges with Riverside Avenue at Cedar Street, just ahead of the on-ramp to the Maple Street Bridge. A four-lane viaduct travels above Peaceful Valley from Riverside Avenue to the Spokane River crossing. A label scar on the overhead for the bridge reveals its former existence as a toll bridge (tolls were lifted in 1990). Photo taken 09/01/06. Inland Empire Way (old U.S. 195) splits with Sunset Boulevard (former U.S. 2-10-395) southwest of Cannon Street and veers southward under the former Sixth Avenue (now Sunset Boulevard east). Photos taken 09/01/06. Inland Empire Way passes under a high level BNSF Railroad bridge and Interstate 90 as it parallels Hangman Creek southward. Photo taken 09/01/06. Sunset Boulevard (Business Loop I-90) meanders east through the Garden Springs area to intersect Government Way at West Spokane. Government Way leads north from Lindeke Street to High Bridge Park and Spokane Falls Community College. Photo taken 08/03/11. Sunset Boulevard narrows to two lanes and crosses Hangman Creek along an arch bridge parallel to both the BNSF Railroad and Interstate 90 & U.S. 2-395. Photo taken 08/03/11. “How The Valley Has Grown.” The Spokesman-Review, December 15, 1994. “Lane Changes Sprague Avenue Interchange Realignment And Other I-90 Projects Starting This Summer.” The Spokesman-Review, February 13, 1997. “Sullivan interchange nearing completion.” The Spokesman-Review, June 1, 2002. “Comin’ Through – Freeway Interchange Project Will Transform Evergreen Corridor.” The Spokesman-Review, November 14, 1998. “Crews To Rebuild Sprague Interchange Work To Relieve I-90 Bottleneck Starts Monday.” The Spokesman-Review, August 30, 1998. “I-90 work to snarl traffic.” The Spokesman-Review, October 12, 2001. “Evergreen interchange now open.” The Spokesman-Review, May 5, 2001. “Valley I- 90 widening work starts Aug. 11 – $34.2 million project will add a lane each way from Argonne to Sullivan.” The Spokesman-Review, July 30, 2003. “Region Gets Money To Fix Problems Roads Federal Money Will Cover Widening U.S. 395, I-90 To Sullivan.” The Spokesman-Review, June 10, 1998. “Hearing To Examine Freeway Impact.” The Spokesman-Review, September 26, 1995. “Freeway Hearing Draws 150 Wary, Interested Show Up To Figure Impact Of Route North.” The Spokesman-Review, September 29, 1995. “North-South Freeway: Going Nowhere Fast No Action Expected On Latest Route Proposal.” The Spokesman-Review, August 27, 1995. “Freeway Hits Dead End I-695 Zaps Funding, Leaves Homeowners In Limbo.” The Spokesman-Review, November 12, 1999. “Freeway start ends long drive – After 50 years of debate, first segment of north-south freeway to get start Wednesday.” The Spokesman-Review, August 20, 2001. “I-90 widening work in Valley completed.” The Spokesman-Review, November 17, 2005. “Work on Pines, I-90 interchange set for spring – Work is expected to take five or six months.” The Spokesman-Review, October 7, 2006. “Freeway at 50 – Region’s main transportation corridor has patchwork past, uncertain future.” The Spokesman-Review, September 10, 2006. “LURE OF THE OPEN ROAD – North-south route promises economic opportunities.” The Spokesman-Review, August 23, 2009. “I-90 Widening In Valley Joins List Of Current Projects.” The Spokesman-Review, March 28, 2011. “U.S. 2, Meet Your Newest Neighbor – Interchange with corridor opens next week.” The Spokesman-Review, November 2, 2011. “Widening of I-90 Is Nearly Complete – All six lanes to open by month’s end.” The Spokesman-Review, November 7, 2011. “Overpass Freeway Project’s Next Step – Bridge will be rebuilt at Francis Avenue.” The Spokesman-Review, January 9, 2012. “MLK Jr. Way Opens Thursday.” The Spokesman-Review, May 29, 2012. “Northern Corridor Segment To Open.” The Spokesman-Review, June 11, 2012. “Getting There: U.S. 195 intersection upgrade under way.” The Spokesman-Review, January 14, 2013. The Maple Street Bridge, Spokane Historical. Page Updated July 18, 2013.